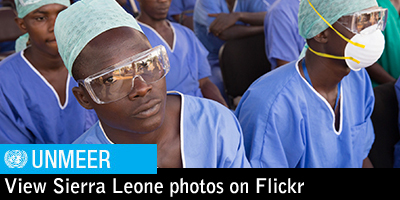 On 24 May 2014, the first cases in Sierra Leone - in Kenema - were reported. Sierra Leone remains among the world’s poorest countries, ranking 180/187 countries in the United Nations Programme for Development (UNDP) Human Development Index. Preceding the Ebola Virus Disease (EVD) outbreak, decades of economic decline and armed conflict had dramatic consequences on the economy. A state of emergency was declared on 31 July 2014 by President Koroma. As at June 2015, the combined weekly incidence fluctuated between 8 and 15 confirmed cases in Sierra Leone. This is the lowest reported number since mid-May. The geographical area of active transmission has remained the same since May in Sierra Leone: almost all transmission is now centred in and around the western coast of Sierra Leone. Kambia, Port Loko and Western Area Urban (including the capital, Freetown) accounted for 33, 54 and 13 % of all confirmed cases, respectively, from 1 to 28 June (the other 11 districts reported no cases). In Sierra Leone, Operation Northern Push was launched on 16 June. It has been designed to identify, contain and eradicate Ebola from infected areas in the districts of Kambia and Port Loko by employing strengthened surveillance, contact tracing and, when necessary, quarantine and by strictly enforcing existing bylaws. The strategy relies on the public to telephone a designated number to report people displaying symptoms or community deaths. Between 1 and 28 June, there were 1,611 alerts for people with Ebola-like symptoms and 6,606 burial alerts, of which some 99 % per cent were responded to within 24 hours. Contact tracing remains vital in understanding the chains of transmission and rapidly isolating contacts who become symptomatic. In Sierra Leone, cases are distributed across three districts, with about 1,500 contacts under follow-up (as at 28 June). 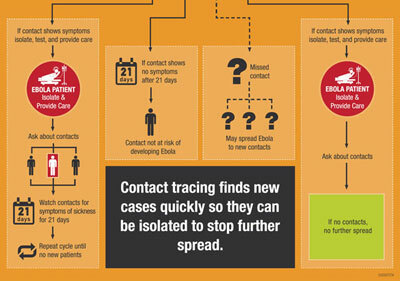 Some 98 % of those contacts are being traced daily, with an average of 23 newly registered contacts per confirmed case. 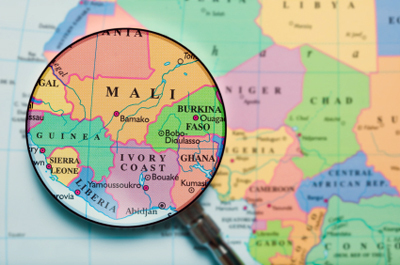 Of the newly confirmed cases reported, 70 % arose from registered contacts in Guinea between 1 and 28 June, compared with 73 % over the same period. Current treatment capacity far exceeds need. Accordingly, the World Health Organization (WHO), in coordination with ministries of health and partners, has continued to pursue the safe decommissioning of surplus Ebola treatment centres. Ten core centres, strategically located to ensure complete geographic coverage, with additional rapid-response capacity held in reserve, have been maintained in Sierra Leone. There is sufficient laboratory capacity in Sierra Leone to meet existing needs. In June, the number of operational laboratories, coordinated by WHO, decreased from 11 to 9 in Sierra Leone. In June, 6 of the 20 deaths from Ebola occurred in the community although there is sufficient capacity to conduct safe burials at the national level. Hence, unsafe burial practices remain of concern. The response of the UN system has focused on activities to achieve zero transmission, including reinforcing active surveillance, contact tracing and community engagement and mobilization. In Sierra Leone, efforts are also under way to assist the Government in restoring basic services and preparing for the transition to early recovery. Médecins sans frontières (MSF) - its outreach and social mobilization teams - continued to carry out activities in Sierra Leone, with a particular focus on Kambia and Port Loko districts. Its epidemiological team is investigating the resurgence of Ebola cases in Freetown. The International Federation of Red Cross and Red Crescent Societies continued to work with national Red Cross societies as the lead partner in safe and dignified burials. In Sierra Leone, 55 Red Cross safe and dignified burial teams conducted 1,763 safe burials and disinfected 1,436 houses. WHO has continued to coordinate and deploy international technical assistance from the Global Outbreak Alert and Response Network for nationally led response efforts, deploying 23 experts for critical response functions. To support Operation Northern Push, WHO has deployed to the districts of Kambia and Port Loko more than 100 personnel, including epidemiologists, infection prevention control specialists, clinical mentors and geographic information system specialists. At the end of June, WHO and UNICEF community engagement and risk communication experts visited Sierra Leone to support the Ministry of Health and Sanitation, WHO and UNICEF country staff and other partners involved in vaccine trials and immunization programmes. The World Food Programme (WFP) extended its emergency operation until September, retaining the capacity to care and contain as transmission continues in the affected countries. To support Operation Northern Push in Sierra Leone, it delivered food rations to quarantined households and provided vehicles to its partners and to the district Ebola response centres to transport mixed commodities. The WFP-led logistics cluster supported various campaigns by facilitating the transportation of tents to build the UNICEF base camp in Sierra Leone. Through the emergency telecommunications cluster, Internet services continued to be provided to humanitarian facilities, ensuring reliable Internet access for humanitarian responders. The cluster is planning to withdraw Internet connectivity in locations declared free of Ebola and retain it where transmission is continuing. It is also working on a transition plan to avoid service interruptions. 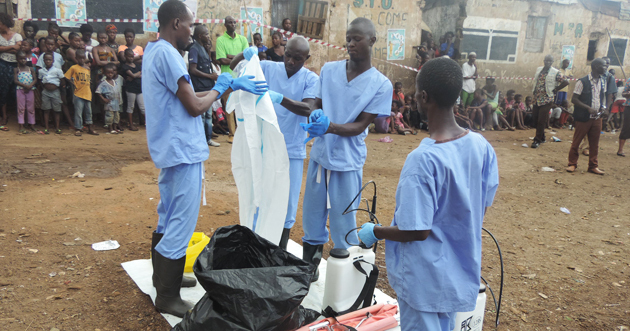 In Sierra Leone, the International Organization for Migration (IOM) and implementing partners continued to train health-care professionals and front-line responders on infection prevention and control and clinical care. In the light of the decline in Ebola transmission, the number of trainees has decreased, falling from 150 per week in May to some 120 per week in June. In addition, to ensure safe migration and better health management, IOM is currently carrying out humanitarian health and border management activities at the Guinea-Sierra Leone border crossings. To maintain effective checkpoint operations, it is providing tents, hygiene kits and other equipment at the borders. The United Nations Population Fund (UNFPA) continued to support enhanced contact tracers and contact tracing supervisors. As part of its support for Operation Northern Push, it provided 12 motorbikes to the Ministry of Health and Sanitation, while two vehicles are being used in the districts to support contact tracing activities. The United Nations Development Programme (UNDP) is providing regular monthly Ebola risk allowances to some 3,000 repurposed Ebola response workers. More than 70 per cent of payments have been made through banks and the remainder through mobile network operators. To support Operation Northern Push, it has deployed a network of 10 civil society organizations to monitor response activities in the districts of Kambia and Port Loko. The Office for the Coordination of Humanitarian Affairs (OCHA) continued to monitor humanitarian needs in Sierra Leone, providing operational and technical support to emergency preparedness and contingency planning mechanisms and assisting with preparations by non-governmental organizations (NGOs) for the International Ebola Recovery Conference held on 10 July. OCHA also established an intersectoral coordination mechanism, facilitated the compilation of needs assessments and worked with donors to mobilize support for a capacity assessment project. UNMEER continued to draw down its programmatic activities ahead of its transition and handover of all operational functions to the UN country team. It provided financial incentives for contact tracers, social mobilizers and cross-border and inter-district surveillance teams, including in relation to Operation Northern Push. It also procured rations for Sierra Leonean police officers involved in Ebola operations, hired boats for use in riverine areas not accessible by road and distributed materials to support the operations. With funding from the Ebola Response Multi-Partner Trust Fund, UNMEER has paid the salaries of 32 core staff of the National Ebola Response Centre and has supported critical Ebola response surges at various times with more than $550,000 from the Trust Fund. In anticipation of the Mission’s closure, the Centre has relocated its offices. The United Nations Office for Project Services in Sierra Leone has been selected to act as a financial service provider and will be responsible for paying the salaries of the 32 situation room and former UNMEER staff embedded in the Centre. WHO is working to strengthen national awareness of and build capacity in infection prevention and control and patient safety practices. The Organization is supporting the establishment of a new infection prevention and control unit at the Ministry of Health and Sanitation and providing technical support for the implementation of infection prevention and control standards in health-care facilities in collaboration with the United States Centers for Disease Control and Prevention and the Ebola Response Consortium. It is coordinating technical input for the development of the first national infection prevention and control guidelines and training package. UNICEF supported 13 district health management teams with the organization of on-the-job training, coaching and mentoring for 165 chiefdom health supervisors, who will mentor and supportively supervise staff of the health facilities in their respective chiefdoms. It also supported the National Pharmaceutical Procurement Unit in redistributing free life-saving medicines for children under 5 years of age and for pregnant and breastfeeding women to 1,184 peripheral health units in all districts. Child protection efforts were strengthened through the deployment of four additional child protection staff to increase the monitoring of children in quarantined households and to provide technical support to the authorities and partners in responding to protection and psychosocial needs. The Ministry of Education, Science and Technology of Sierra Leone, in collaboration with UNICEF and partners, is monitoring adherence to safety protocols in schools, focusing on the hotspots of Kambia, Port Loko and Western Area Urban. Recent data from Kambia and Port Loko show that 88 per cent of schools are observing all three safety protocols in hand washing, temperature monitoring and cleaning. About 95 per cent are observing hand washing and temperature monitoring. In addition, 41 radio stations are broadcasting learning programmes. Important progress in combating Ebola continued to be made during the reporting period. Eight cases were reported in each of the two weeks to 28 June, the lowest case incidence since mid-May 2015. Those gains notwithstanding, there continue to be setbacks in efforts to achieve zero transmission. Concerns remain over the prevalence of unknown chains of transmission in Sierra Leone. The response to the last remaining cases remains challenging. The leadership, technical and specialized expertise and coordination of WHO in reaching and remaining at zero cases are increasingly critical at this definitive moment in the response. Communities are and will continue to be the driving force of the response as efforts to identify and uproot the triggers of transmission in the remaining affected localities continue. With a view to strengthening response efforts on the ground and addressing remaining hotspots, Operation Northern Push in Sierra Leone is being implemented. The Mission’s transition process has been completed and its operational functions were handed over to national partners and UN agencies, funds and programmes on 30 June. 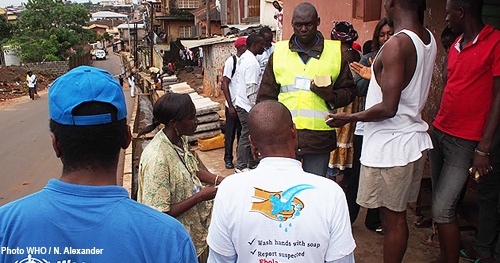 Read how a community has been proactive in taking ownership of outreach and sensitization programmes about Ebola. Its members believe in the process of being the gatekeepers for keeping their neighbourhood safe and vigilant. 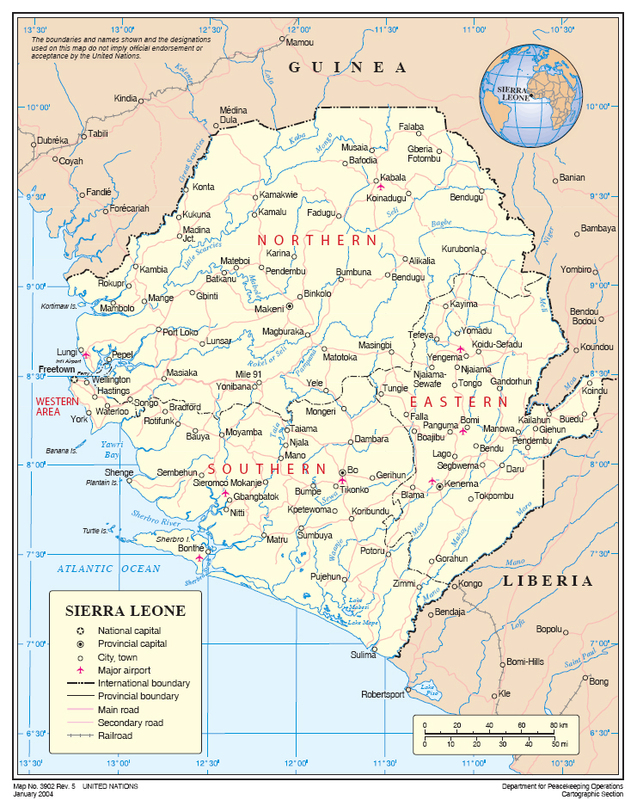 Where in Africa is Sierra Leone?